Flea infestation is a very common problem and treatments for fleas are the essential part of the health regime of pet dogs. Fleas can cause various discomforts in dogs. Lots of different collars and solutions are available for treating fleas. Seresto is a highly effective, reliable alternative to monthly tick and flea treatments. Seresto dog collars use an exciting, innovative technology for releasing the active ingredients. 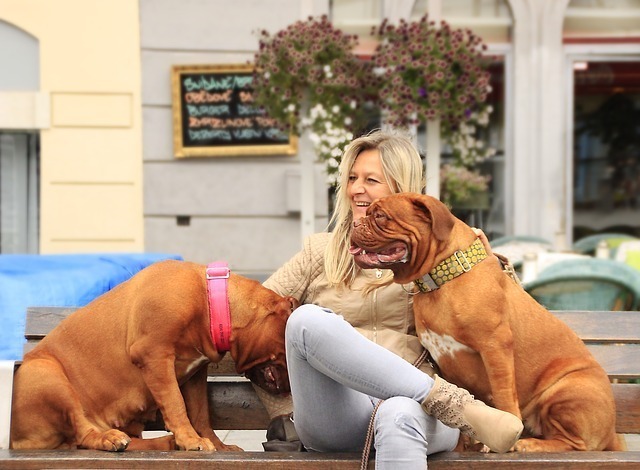 How to Select the Best Seresto Dog Collar? What's the need of Seresto dog collars? This is a highly effective, long-lasting solution for controlling tick and flea without any inconvenience. This is the best method for protecting your pets from flea larvae, flea eggs, fleas, ticks, sarcoptic mange on dogs. Separate formulations are available for small, medium and large dogs, and cats. The Seresto dog collars are designed to prevent infestations and kill parasites in the coats of dogs. In order to get the best benefit, it should be used for 8 months. This is the safe and simple alternative to short-lived flea treatment options. A sustained release technology is used in Seresto dog collars for releasing active ingredients over an extended period of time. Once you apply the Seresto dog collar, active ingredients are transferred from it to the hair of the dog and finally the skin. Then, these ingredients are distributed evenly throughout the hair and skin. Seresto dog collars use two active ingredients such as Flumethrin and Imidacloprid. The former is effective in repelling and killing ticks while the latter is effective for killing adult fleas and flea larvae. First of all, ensure to purchase a collar at the right size of your pet dog. A large size collar can be selected for your full-grown dog. Convenience has a significant role while selecting a flea collar. If the collar is convenient, there is no need to change it frequently. To provide maximum protection to your dog, the Seresto dog collar should be effective for dealing with both ticks and fleas. The active ingredients must be checked before purchasing a Seresto dog collar. Do not purchase a collar if the active ingredient is Tetrachlorvinphos (TCVP). This neurotoxin attacks the nervous system of fleas. Proper care is essential for handling all insecticides. TCVP is unsafe for both animals and humans. The Bayer Seresto Flea Tick Collar is operating on the basis of an innovative delivery system, which offers perfect protection against fleas and ticks for 8 months. By repelling and killing fleas and ticks, it provides the performance of a topical. This non-greasy and odorless collar is ideal for small dogs of 7 weeks and older. This water-resistant flea collar remains effective even during occasional swimming, bathing or after exposure to sunshine or rain. It is highly effective for eliminating pesky pests. The Seresto Flea and Tick Collar﻿﻿ is the best option for those who are not interested adopting topical solutions for treating flea and tick infestations in their pet dogs. As a result, the active ingredients are released slowly on a continuous basis for around 8 months. The Seresto Flea and Tick Collar by Bayer are water resistant. Thus, it will be highly effective even if your dog takes bath frequently. Exposure to sunshine or rain will not diminish its effectiveness. However, the duration of coverage will be reduced to 5 months if your dog is a frequent swimmer. Quick release mechanism is the other great feature of Seresto Flea and Tick Collar by Bayer. It allows your pet dog to get out of it. The collar will be painful for your dog if he is a frequent wanderer. The collar will also protect your dog from hanging themselves accidently. The Seresto Flea and Tick Collars by Bayer are available in two sizes, small and large. You can also cut the excess length off to fit your small dog. The Illumiseen LED Dog Collar is ideal for getting optimal visibility and safety. It falls in the middle of the budget range flea collars. It is highly comfortable, user-friendly and fully adjustable. The general construction of this collar is also very good. One hour of charging provides 5 hours of illumination, which is enough for many walks. The Illumiseen LED Dog Collars are available in different sizes, which is suitable for all breeds. Long lasting batteries, nylon construction, and four modes are the other peculiar features of this flea collar. The 4 modes of lighting are fast blink, slow blink, solid light, and off. Flea treatment is an essential part of the healthcare regime of dogs. These pets cause lots of discomforts, which is very common in dogs. Lots of different solutions are available for dealing with these problems. 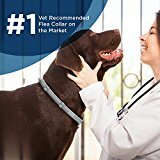 But the best among them is Seresto flea collar for dogs. This flea collar is developed for providing longer lasting relief against both ticks and fleas. It is also capable of repelling other pests like mange. However, it is mainly used for eliminating dog fleas and ticks. This flea solution is designed for preventing re-infestation. The effectiveness of this collar will last for 8 months. This is a simple and safe alternative for short-lived, messier flea treatment options. Seresto is a vet-recommended flea collar, which is the biggest advantage of this dog collar. Sustained release technology is used in this collar, which is helpful for releasing chemicals over longer periods of time. Various customer reviews showed that it is ideal for removing fleas and ticks quickly and effectively. This is a non-greasy collar, which is the best alternative for unpleasant topical solutions for fleas and ticks. The collar is odorless, which is an added benefit. Quick release mechanism is the other interesting dog-friendly feature of this collar. ​There are two active ingredients in Seresto collar. One is Imidacloprid and the other is Flumethrin. The former kills flea larvae and adult fleas, while the latter kills and repels ticks. These ingredients are highly useful for killing larvae and ticks in its younger stage. ​The effectiveness of this dog collar can be maintained even after frequent swimming, shampooing or exposure to rain. The breakaway release mechanism is the other important feature of this collar. It contains a reflective chip, which can be applied during night. ​It is highly effective for killing ticks within 6 hours and fleas within 2 hours. Thus, it is a quick and effective solution for these types of pests. The speed of kill has a greater role while controlling ticks and fleas. It is essential to kill a flea before it lays eggs. Usually, this period is within 24 hours. You should be able to kill ticks in the same manner, which is essential for avoiding transmission of disease. It is considered as the best solution for problems such as fleas and ticks and protecting the health of your dogs. It is highly effective and provides you a longer benefit. However, the overall tick and flea prevention depends on the preferences. This collar is ideal for those who want to seek the best solution over topical products. If you purchase this dog collar, you need not worry about fleas and tick problem for 8 months. Seresto dog collars are notorious for their adverse effects on dogs. Despite their obvious benefits, these dog collars have proved to cause severe side effects that can be harmful to your pet. Insect medications are a fundamental piece of the social insurance administration of our pets. Bugs and Ticks bring uneasiness to your little creatures. ​There's no doubt that the Seresto collar is an exemplary and excellent way to protect your pets, and manage the fleas and ticks but how does it work? The Seresto dog collar uses a combination of two chemicals, Flumethrin and Imidacloprid, which act as insect repellents. In fact, the side effects are also a result of these two main chemicals. But does that have any concern with our pets? ​Well, the real answer is yes, and no. The genuine answer depends completely on your pet. For the most of the animals, if there is any side effect of the Seresto collar use, it'll be minimal. ​How Do These Issues Arise? ​Issues emerge when you put your insect collar or tick collar for puppies on a creature that is sensitive to the dynamic fixings or the active ingredients. ​What Are The Possible Side Effects Caused By Them? ​A close look at their product flyer demonstrates that the Seresto symptoms are really deadly to bugs and ticks. These collars are an 8-month flea collar and repel. It kills ticks for the 8 months (Only if it used correctly). ​However, one must understand that the results largely depend on factors such as your pet's natural resistance to these chemicals, or climatic conditions. Therefore it is also advisable that you may consult your local vet prior to using these collars. Likewise, with anything in life, a treatment is just helpful on the off chance that it is powerful. No pet lover would ever want to see their pet harmed. In such circumstances, It is advised to the owner to take accurate and legitimate decision in buying these for their pooch. Many people around the globe and mostly Americans are currently are facing these problems. Everybody hates ticks and fleas. It is a problem that most pet owners like you struggle with. There are many solutions out there. However, you may have chosen the most convenient way. That’s right, using flea collars by Seresto. ​It uses active ingredients that are the natural enemy of fleas and ticks. Those ingredients can be harmful to your dog. It is uncommon but it is possible. These chemicals may have a harmful effect on your dog. If you observe these effects, then you should immediately remove that flea collar. ​If your dog experiences on or all of those, then the collar may be at fault. Immediately remove it, wash your dog, and check your dog to his veterinarian. It is because of the insecticides that are present in the Seresto dog collar, which is allergic to certain dogs. ​Some dogs experience vomiting hours after wearing the Seresto dog collar while others experience it after weeks. This side effect also includes loss of appetite and diarrhea. If your dog vomits immediately after wearing the dog collar, then it is very harmful to him. If not, continue to monitor him every day. The side effects may come gradually. If see any abnormal signs, remove the collar immediately. If ever your dog finds it hard to breathe after wearing the dog collar, then must be another side effect. This includes weakness and instability in walking. Remove the collar immediately. Don’t let this side effect escalate to convulsions. ​Seresto dog collars are made with chemicals that are intended to prevent fleas and ticks from infesting your dog. They do not mean harm, but it still has an unpredictable effect. Foreign chemicals will be placed on him unexpectedly. These side effects may be due to him not being used to these chemicals or that your dog is allergic to some chemicals. Be sure to ask your veterinarian about it. Dogs are our loyal companion. We must treat them with care and respect, just like our fellow humans. If it compromises the health of your loyal partner, then be content in using flea combs. The alive dog is better than a dead dog after all. Fleas and Ticks infected in your dog can be hard to control. There are several ways in which you can get rid of the ticks and fleas, and one of the latest techniques is actually by use of Seresto Flea Collar. Despite this being one of the most trending techniques we also need to know how Seresto Flea collar making dogs sick. Hence, we will have to look at the side effects of the Seresto Flea Collar making dog sick. The side effects of the Seresto Flea Collar for dogs makes it one of the defective products that you can consider. Despite this, it’s also a useful product that you can think. Comparing the sentiments from the manufacturer of this product and what the real users of this product say they are contradicting. Basing on the opinions from the various users of this product then this is not the ultimate technique that you can use. The high rate of the negative reviews of this product raises a red flag on whether to use this product or not. ​At first, this minor side effects only existed on the dog pets that had allergic reactions to the product. Later on, the negative reviews on the side effects of this product seen on a large number of pets which made it be a primary concern to people to be cautious. ​Treatment is useful when it effective hence basing on the various reviews about the Seresto product it's clear enough that it's not effective. The various facts that do support how Seresto Flea Collar Making Dog sick is clear enough that this is a product that you need to keep your dog away. Despite this product having various side effects, it’s also a useful product that will keep your do away from fleas and ticks for quite some month. There are so many other products in the market that you can consider so as to keep away the fleas and ticks from your Pet. Lots of flea treatment options are available today. You must take some basic safety tips if you want to go with flea collars. Flea collar treatments are designed for dogs and puppies. Thus, you should never use it for your pet cats because they have their o﻿﻿﻿wn flea treatments. If you apply dog flea collars to your cats, it can be fatal to them. Before purchasing a flea collar, you must be aware of the exact weight of your dog or puppy. Your pet dog will be much happier and healthier if you adopt the right flea treatment. Fleas can cause lots of serious illnesses and even death. Some of the common problems that are associated with fleas are flea anemia, tapeworms, flea allergy dermatitis, lethargy, etc. Above mentioned Seresto dog collar reviews are highly helpful for preventing this problem. Soresto collar is not working properly, I bathe my dog every couple of weeks, take her to get groomed every two months and even with the soresto collar I am still finding fleas on her. I put this collar on my six year old Springer. This dog is probably one of the most gentle animals who ever walked the earth. He was until i put the collar o in September. We noticed subtle changes in November. By mid December he was a nervous wreck. He even began to growl at us. By Christmas he was out of control. He began panting, pacing, and stopped taking our commands. We took the collar off December 28 and almost overnight we had our dog back. I believe that if we had not removed the collar he would have died. My advice to a dog owner who is considering using Seresto is to investigate reports of behavioral changes and even death attributed to this product. yes it happen to my germand sheperd to he just pass after I put the soresto collar he never was the same ,5 days after I removed the collar he was fine ,but am sure that affect his keeynes that whu is not here ,please think before you purchace this collar. I put a flea collar on my 11yr. Old lab and by that night she had a terrible seizure. It scared me to death. I removed the collar immediately and she was ok by the next morning. She wore a collar for 8 months without any problems. Don’t know if you changed anything or if she just developed an allergy to something in it. I can’t have a furry pet, but I love the TV ad–it’s jolly. Deserves an award. So little jolliness on TV these days..
It’s great for getting rid of fleas,but this poor dog has lost more hair in 6mo.then his whole life. Scratching and itching, back to the drops. I have been purchasing Seresto for over 2 years for my 4 dogs. I purchased this time and my dogs still have fleas. One of my dogs had to go to the vet because of the severe skin condition costing me an additional $200. I had a lot of faith in this product until now. BEWARE – on line there is a website advertising Seresto $29.99 – free shipping. THESE ARE NOT SERESTO COLLARS! They are packaging their own product in Seresto cans. I could not find website the advise Bayer of this fraudulent situation. Very strong citronella odor which is not found in Seresto. We moved to Houston, TX from Wisconsin about 2 years ago. Last year, our little Cockapoo became infested with fleas. I’ve had experience with fleas, so I started my natural treatments…essential oil sprays, natural fleas shampoo, garlic, DE. Nothing was working and she went from bad to worse. My groomer told me that natural treatments do not work here in Houston, the fleas are too hardy and numerous. She recommended the Seresto collar. I was desperate so I picked one up at Walmart and put it on her (May). Within hours, we were finding dead fleas on the floor and within a week or so she was flea-free. Great day!! She did not exhibit any side effects that we noticed. We took it off of her in December and gave her a break. This year, 2018, I waited till I saw the first flea around mid-March and put a new Seresto collar on her fully expecting that it would work as it did the previous year. Unfortunately, it did NOT work. She continued to have fleas, was scratching constantly and developed a horrible itchy red rash all over her belly, chest, “armpits”, groin area and some on her back and rump. She was miserable…we were all miserable just watching her. I was told she was reacting to the flea bites and we needed to treat the yard, house and her to get it under control. We did all of that, adding Frontline to back up the Seresto collar. Still she had fleas…and this rash. In August, the vet suggested Bravecto. Our dog was tortured with itching all the time…so we succumbed and gave her 1 dose of Bravecto. Within a few days, her belly rash intensified and she was literally running around the living room rubbing up against the furniture and running her ears on the carpet. We shaved her belly, bathed her with natural anti-itch dog shampoo and then slathered her belly with Zinc Oxide, gave her an antihistamine and put her to bed. I did NOT put her Seresto collar back on. Next morning her rash was significantly better. We did the same treatment that night and then the 3rd night slathered her belly with coconut oil. Now her belly is clear, pink and healthy looking. We also started giving her Eveining Primrose oil, 1000mg. orally at night. We have not put the Seresto collar back on her. She still seems to be itchy but nothing like she did when she had the Seresto collar on. She is likely reacting to the Bravecto…which, by the way, has been effective at keeping the fleas away. But now that will be in her system for another couple of months. And now, I really don’t know what to do for the fleas. I know they’ll be a problem again come March. I’m open to suggestions….maybe I’ll try the garlic again. Wondering about Soresto and autoimmune disease in dogs, is there an increased risk of a dog developing an autoimmune disorder, such as sebaceous adenitis, with use of this product? Are there studies to conclude one way or the other? What I want to know is if your dog is having a severe reaction to the seresto collar, what do you need to do emergently? I am just worried if I put this on my dog and they have a severe reaction, I am an hour from a vet.